The Clintons Honor Nancy Reagan For Her "Remarkable Legacy Of Good"
Former President Bill Clinton and Democratic presidential candidate and former Secretary of State Hillary Clinton spoke fondly of Nancy Reagan in a statement sent to Bustle after her news of her death was made public. The former First Lady died Sunday at the age of 94 from congestive heart failure at her home in Los Angeles, Reagan's spokeswoman said, and many politicians and celebrities around the country mourned the loss of Reagan. Despite a controversial start to her tenure as First Lady from 1981 to 1989, Reagan wielded a powerful influence on her husband's political decisions. Nancy was an extraordinary woman: a gracious First Lady, proud mother, and devoted wife to President Reagan—her Ronnie. Her strength of character was legendary, particularly when tested by the attempted assassination of the President, and throughout his battle with Alzheimer's. She leaves a remarkable legacy of good that includes her tireless advocacy for Alzheimer’s research and the Foster Grandparent Program. We join all Americans in extending our prayers and condolences to her beloved children and her entire family during this difficult time. In a separate note on her official Twitter, Clinton again noted her appreciation for Reagan's tireless advocacy efforts, saying "Nancy's strength of character was legendary, and her advocacy—especially for Alzheimer's research—was tireless." Clinton also said she was "praying for her family." In 2015, the satirical news site National Report published a false report claiming Reagan had endorsed Clinton. The article, which was accidentally picked up by Bloomberg, falsely claimed Reagan had told the History Channel it was time for a female president in an interview. Although Reagan wasn't the Clinton supporter that satire painted her to be, she was reportedly not very fond of the 2016 Republican presidential candidates either — despite their constant praise for her husband — her daughter Patti Davis told the Huffington Post in a SiriusXM Progress interview last December. "I don’t talk to her too much about politics currently. She’s 94, and I think she has the right to live out the rest of life with a little bit of peace, which cannot be found in the current political scene," Davis said. "I don’t think she’s too happy about anybody on the current roster right now. I mean, there’s nobody presidential. Not in that group anyway." 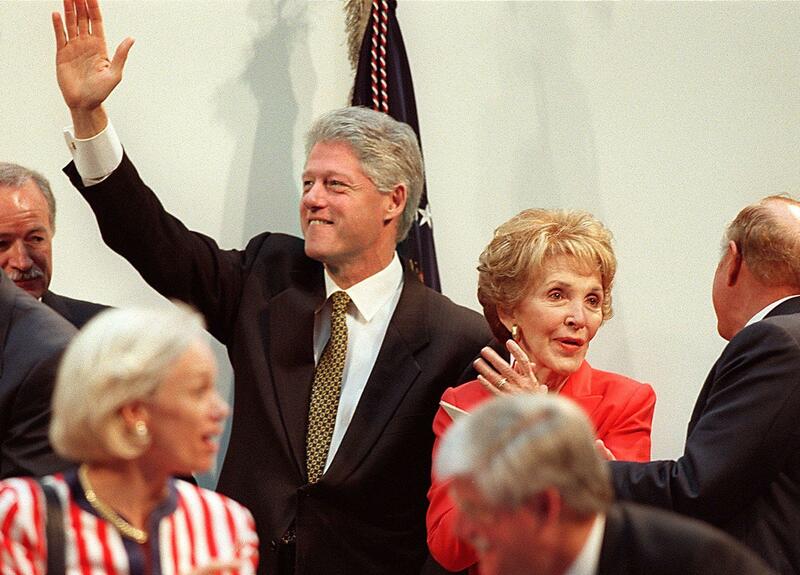 While Reagan may not have been rooting for her fellow First Lady to move back into the White House under a different role, Clinton's tribute to the conservative icon's legacy proves that political differences can be bridged.